B&B Electronics, a developer of mission-critical network connectivity products, today introduced its Wzzard™ Intelligent Sensing Platform. 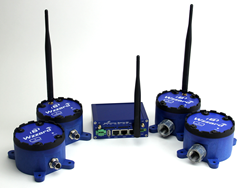 Wzzard is an easy to use, complete wireless sensor connectivity platform for the rapid deployment of scalable, intelligent, reliable Internet of Things (IoT) networking in remote and demanding environments. Wzzard was designed to help integrators, VARs and service providers efficiently develop and deploy secure, smart, self-powered, and scalable IoT applications. Platform details available from the B&B Smart-Sensing Website – . Founded in 1981, B&B Electronics Inc. provides intelligent M2M and IoT connectivity solutions for wireless and wired networks. Specializing in device connectivity at the “edge” of networks in remote and demanding environments, the company designs and builds products using Ethernet, serial, wireless and USB communication technologies. Working globally with experienced channel and application partners to deliver complete application solutions, the company is known for building rugged networking products that are easy to deploy and easy to manage. All products are manufactured in the US and European Union with local field applications engineers available worldwide for localized technical support. B&B Electronics is headquartered at 707 E Dayton Road, Ottawa, Illinois USA with EMEA operations based in Galway, Ireland. Additional engineering locations are based in California and the Czech Republic. 800-346-3119 | .